We’d love your help. Let us know what’s wrong with this preview of Teen World Confidential by Kim T. Cook. Teen World Confidential offers parents and other caring adults tips and tools to inspire honest conversation about adolescent sexual health. Information is presented in fast-paced five minute reads that fit into your busy schedule. Killing time waiting in the car for your kids to finish practice? 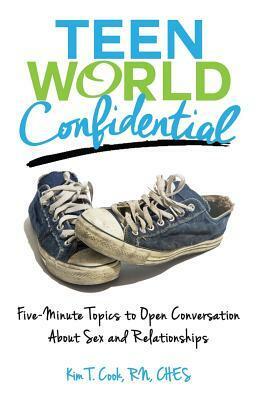 Pick up Teen World Confidential, open a random page, and gain fresh insight a Teen World Confidential offers parents and other caring adults tips and tools to inspire honest conversation about adolescent sexual health. Information is presented in fast-paced five minute reads that fit into your busy schedule. Killing time waiting in the car for your kids to finish practice? Pick up Teen World Confidential, open a random page, and gain fresh insight about current issues affecting teens, 'tweens, and families. Explore conversation starters - and roadblocks - that open the door to honest communication that will continue through the teen years. To ask other readers questions about Teen World Confidential, please sign up.